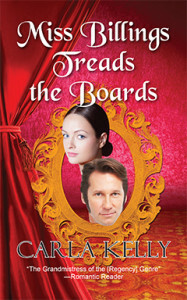 Miss Billings Treads the Boards ($14.95, 266 pp., ISBN: 978-1-60381-915-2) is Camel Press’ third reprint of a Carla Kelly regency romance. First published in 1993, the novel features a gentlewoman who joins an acting troupe during a time when stage acting was considered scandalous. Camel has also reprinted Ms. Kelly’s first novel, the historical romance Daughter of Fortune, as well as a new title, The Double Cross, the first of the Spanish Brand series, set in the Spanish Colony of New Mexico. On Feb. 1, 2014, Camel Press will release Miss Milton Speaks her Mind. With This Ring and Mrs. McVinnie’s London Season will also be released in 2014. Miss Whittier Makes a List and Miss Chartley’s Guided Tour are already available. Ms. Kelly is the recipient of two RITA Awards from Romance Writers of America for Best Regency of the Year; two Spur Awards from Western Writers of America; a Whitney Award for Best Romance Fiction, 2011; and a Lifetime Achievement Award from Romantic Times. Kelly’s Mrs. Drew Plays Her Hand reprint was selected by Publishers Weekly as one of the top 5 romances in 2012. Cynical, lazy Lord Grayson is coerced into delivering a message to lovely Katherine Billings, whose late father frittered away a fortune on artwork. All his purchases were forgeries, save one, which—if sold—would offer Kate a modest living. Meanwhile, Kate has bowed to necessity and set off for Wakefield to become a governess. Gently reared, she has no plans to become a scandalous actress, but Things Happen. Injured by a highwayman hired by his greedy nephew, Lord Grayson staggers to a barn where a play is in progress. There he sees Kate, playing a small role. Through a mishap, she has ended up in Wickfield, not Wakefield, and is performing with the Bladesworth Traveling Company, an acting troupe. What’s a lazy and cynical marquis to do? Using his everyday name, Lord Grayson—Hal Hampton—joins the troupe, partly to protect himself from his nephew, but mostly to get to know Kate better. They both fall under the spell of the impecunious but talented Bladesworths. A charming French émigré, a single-minded Bow Street Runner, and love round out a summer where the repertory includes deception, faux marriage, the law, and enough unsavory characters to suit any would-be Shakespeare. After all, the play’s the thing. A well-known veteran of the romance writing field, Carla Kelly is the author of twenty-nine novels and four non-fiction works, as well as numerous short stories and articles for various publications. Carla’s interest in historical fiction is a byproduct of her lifelong interest in history. She has a BA in Latin American History from Brigham Young University and an MA in Indian Wars History from University of Louisiana-Monroe. You can find Carla online at www.CarlaKellyAuthor.com. He opened one eye and then the other, but the view was still swords and toes. He lay where he was, unable to summon the energy to roll over and constricted by the narrow space. His head throbbed like a species apart, pounding like a pile driver on the back of his neck. With some effort he worked his hand up to his head, feeling again the furrow caused by Wilding’s bullet. The wound was crusted with dried blood. His hand traveled to the back of his neck, where the pile driver was working the hardest, and came away wet with his blood. As he lay there contemplating this new ruin to his head, he remembered a woman with a remarkable bosom. Surely not, he thought. He remembered that she was small and could not possibly have had the strength to deliver the blow that was even now making him queasier by the minute. She must have struck me with something, he concluded. God, what a woman. I hope I do not see her again until I feel better. Grunting softly, Henry eased himself up. He sat absolutely still until the nausea went away and then leaned back carefully against the pile of old clothing. He thought at first that he would leave the wagon before anyone returned, but he could not. He ached everywhere, and even the tiniest shifting of position made the hairs rise on his back. As he sat considering his situation, he heard a great wave of applause from the barn. What is going on in that place, he asked himself. It couldn’t be a cockfight. People didn’t applaud like that at cockfights, at least, not the ones he had attended. His hand went to the back of his neck again. And rarely did women with blunt objects and magnificent bosoms frequent such low business. He sighed and resigned himself to whatever fate awaited, sorry that he had taken off his riding coat, now that the night was cooler, and grateful that he still had his wallet in his pocket. Surely he could buy his way out of any trouble. In a few moments he heard the sound of people leaving the barn. They talked among themselves in low tones, with an occasional burst of laughter. In another moment the light from a candle thrust in his face made him squint and try to cover his eyes. “Oh, please talk softer,” he begged. “My head is killing me.